Taylor Kitsch and Director Andrew Stanton give a behind the scenes scoop on the creation and filming of “John Carter,” which premiered March 9. The film, based on the novel character written 100 years ago by Edgar Rice Burroughs, follows the story of a man who is transported from Civil War America to the planet of Barsoom – better known by humans as Mars. While there, he lands amidst the planet’s own civil war. Written and directed by Andrew Stanton (“Wall-E,” “Finding Nemo”) and starring Taylor Kitsch (“Friday Night Lights,”) the film is bursting with intense action sequences, creative characters and complex CGI. This was a different step for Stanton, who is used to working as an actor, writer and animator for Pixar films. Set against a backdrop of both historical and narrative warfare, the plot of the story focuses on how American hero John Carter adapts to his new surroundings and the varied civilizations he encounters on the planet. These groups include two human-like kingdoms fighting a major war, with “Thark” natives caught in the middle. In addition, there is a group of “therns” who oversee the destruction of the planet. These groups run parallel to most civil wars: two power-hungry sides, natives in the middle and God above. More important than the Barsoom’s war, however, is the war that Carter has with himself. He is a broken man when he leaves planet Earth, and has just lost his wife. He had almost given up everything when he got to Barsoom, but finds new love, and a new and beautiful reason for existence. Kitsch, who plays the title character, told The Temple News that while the film was physically demanding, it was much more about this inner struggle. While the film has a very large budget – approximately $250 million, according to the Internet Movie Database – it has a great deal of intimacy and heart to make it very relevant to the audience. It features themes such as oppression of minority groups, empowerment of women and the questioning of fate and warfare’s existence. On the opposite end of the spectrum, the film’s overarching themes also include the advancement of technology, which in cinema has time and again played a role in challenging faith. Though these messages and more can be found in the film’s subtext, Stanton does not read as much into them in terms of how they play a role in today’s society. 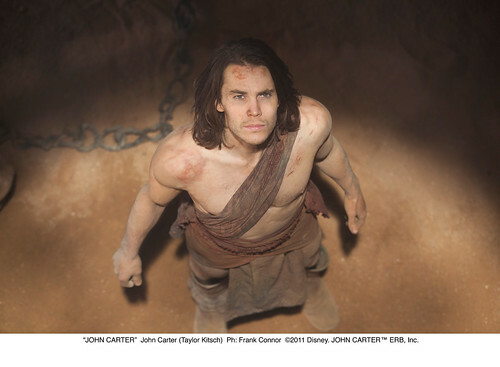 When it comes down to it, though the messages can be interpreted for social context, “John Carter” is really about a man who struggles to find his identity and purpose in an ever-changing world. This is something that anyone can relate to in almost any stage of her or his life. Carter is found at the end of the film, and encourages others to find themselves. Stanton’s vision and Kitsch’s character remind the audience of the true heart of a well-made Disney film. It inspires us to do better in the world, no matter how different or foreign it may be. Matt Flocco can be reached at matthew.flocco@temple.edu.